Last week we welcomed Ysmerline into our care at Angel House Orphanage. Although generally healthy, she is blind in one eye. She often appears to be giving a sour expression because she will squint as she works to focus on what is in front of her. Because she has been confined to just her crib, she has underdeveloped muscles and cannot walk on her own yet. Alix, our orphanage director, comforts Ysmerline. Her first few hours at Angel House were a bit overwhelming. 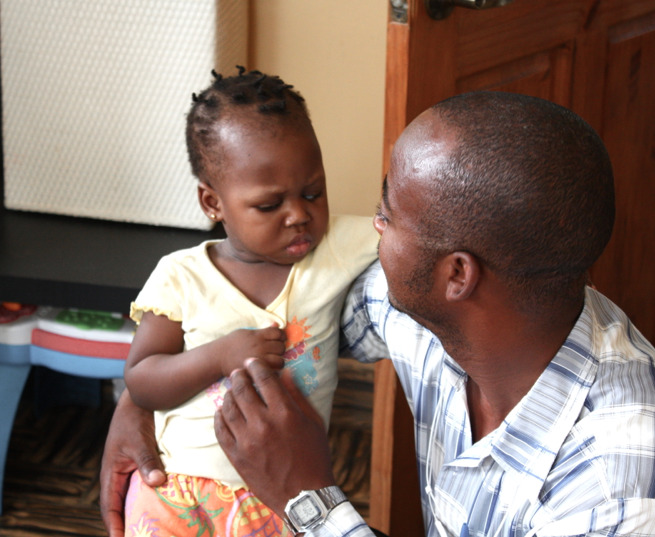 She was checked out by Diane, the medical director at the Orphanage and then introduced to her new friends. The other kids were very gentle with her and shared snacks and even gave her a few hugs and kisses. By the end of the day Ysmerline was actually laughing, smiling and checking out her new surroundings. Be sure and check out the photos. We have great hope for Ysmerline. She is already working on walking, plays well with the other children and is talking up a storm. Our immediate goals are to address what seems to be the cataract on her eye and to find support for her through our Orphan Care Sponsorship program until she can be placed in a permanent home.